The latest British Crime Survey shows a 7% fall in crime between 2008 and 2009, with police recorded crime showing a 3% fall in violent crime. Shadow home secretary Chris Grayling has failed to welcome a fall in violent crime. The latest British Crime Survey shows a 7 per cent fall in crime between 2008 and 2009, with police recorded crime – Grayling’s preferred measure – also showing a 7 per cent fall overall and a 3 per cent fall in violent crime. All he would say of the latest stats is that Britain is a “more dangerous country” than before. On Wednesday, Left Foot Forward showed that a third indicator of violent crime, accident and emergency admissions, also fell between 2008 and 2009. 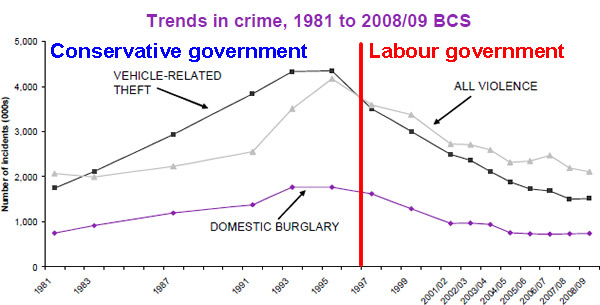 Grayling has repeatedly insinuated violent crime is up, yet has failed to provide evidence for this. The BCS and police recorded crime data also reveal that, unlike during previous recessions, burglary, theft and robbery have all fallen. The BCS shows burglary down 12 per cent, while the recorded crime stats robbery down 5 per cent and household burglary down 3 per cent. During the Tory recession of the early nineties, there was a 19 per cent rise in acquisitive crime in 1990 and an 18 per cent rise in 1991. The public’s perception of anti-social behaviour is also down, from 17 per cent in 2008 to 15 per cent in 2009 – on public drunkenness and rowdiness (down from 26 to 24 per cent); drug dealing and drug use (28% to 26%); rubbish lying around (30% to 29%): vandalism and graffiti (27% to 24%); abandoned or burnt out cars (6% to 5%); and teenagers hanging around on street corners (31% to 27%). The only rise was in noisy neighbours (10% to 11%).